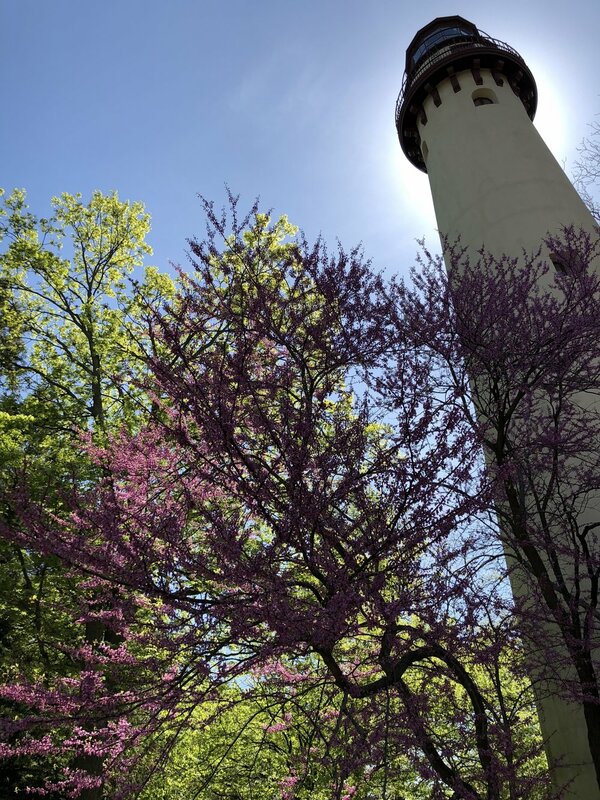 The Grosse Pointe Lighthouse stands on a projection of land which was given its name by the 17th century French fur traders, when Pottawattomi roamed the area. In 1673, Marquette and Joliet canoed past the point with their voyagers on their way east following their exploration of the Mississippi. Marquette may well have camped here when he returned in December of the following year. The first white man to settle in Evanston was on these grounds in 1826. As shipping increased on Lake Michigan, there were several wrecks on the treacherous offshore shoals, prodding the United States government to build the lighthouse. It was completed in 1873, along with an accompanying duplex for its keepers, who kept the oil lamp lighted day and night. 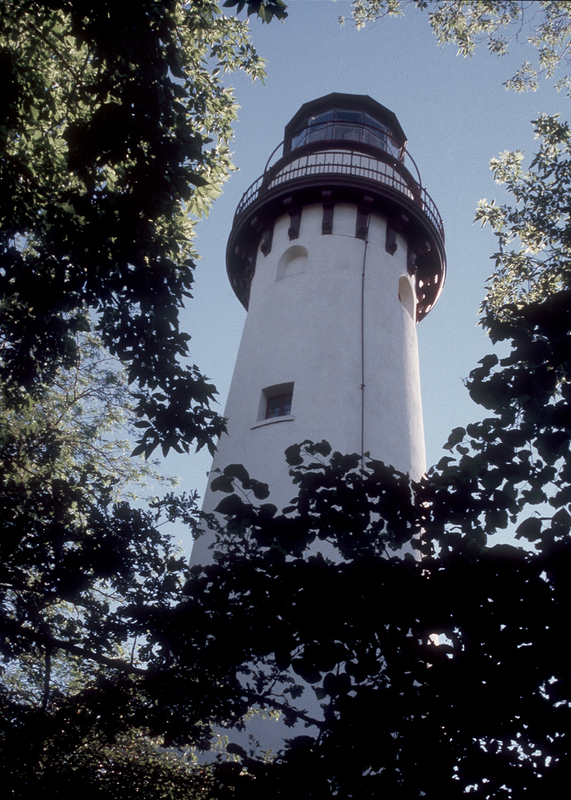 The light is automatic now and the double house is co-occupied by the Superintendent of the Lighthouse Park District, which maintains the park, and by the Nature Center run by the Evanston Environmental Association. In 1937, the park board gave permission for the planting of a wildflower trail to the Garden Club of Evanston. They in turn hired the well-known landscape architect, Jens Jensen, to draw the plans. Native herbs, which had been used for medicinal purposes by the Indians were preserved. Existing trees included black oaks, honey locusts, basswood, sugar and silver maples, black cherries, and American elms. Mr. Jensen's plan added pin oaks, cut-leaf maples, weeping birches, wild crabapples and cherries, as well as witch hazel bushes. 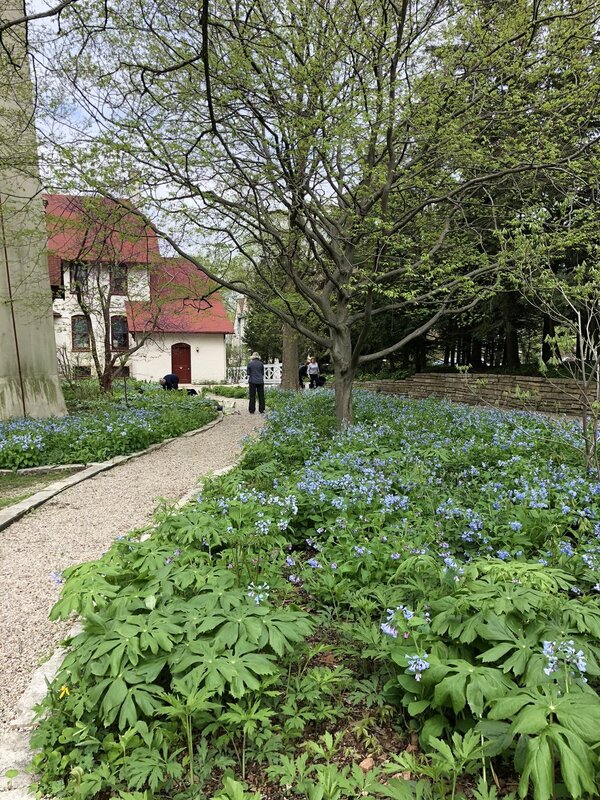 The first planting included eight varieties of violets native to Evanston, a fern collection, and hundreds of wild plants, many of them from places about to be destroyed by highway or residential development and from the gardens of generous club members. Plantings were designed to give the appearance of a natural woodland, except that each species was grouped in a mass to make a better show with the taller plants placed to the outside of the borders and the shorter plants toward the path. A fountain was installed west of the picnic shelter at the south side. Later, a garden seat was added. Dr. Margery Carlson, the first female Professor of Botany at Northwestern University and honorary garden club member and now retired, brought her energy and know-how to the chairmanship of the Nature Trail in 1960. At that time, much restoration work needed to be done. New plants were purchased. Dr. Carlson, a lifelong teacher, made the garden a learning experience for all its caretakers. 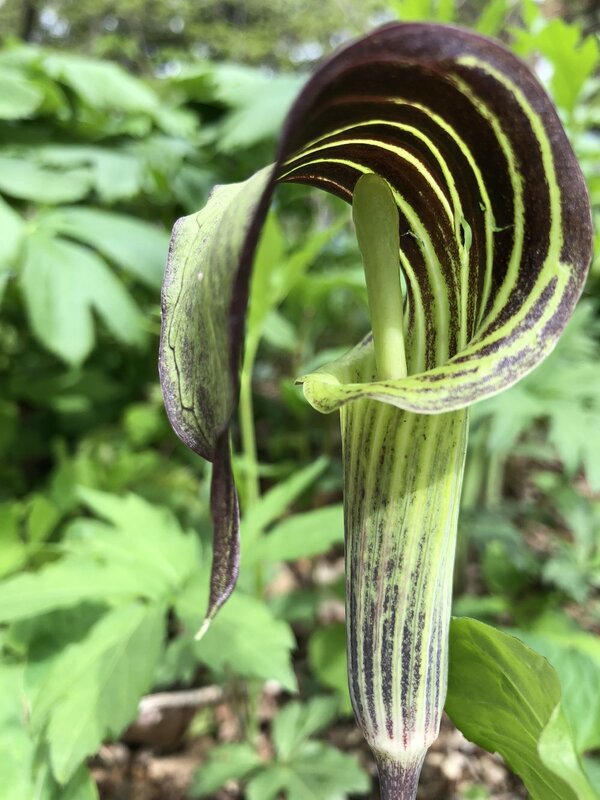 Under her direction, committee members became knowledgeable about the quirks of Jack-in-the-pulpit, Solomon's seal, and Bishop's cap. When Dr. Carlson stepped down from her chairmanship in 1979, Mrs. Charles Bronson, a committee member, stepped into her gardening shoes. Under her able direction, the work and beauty continued. 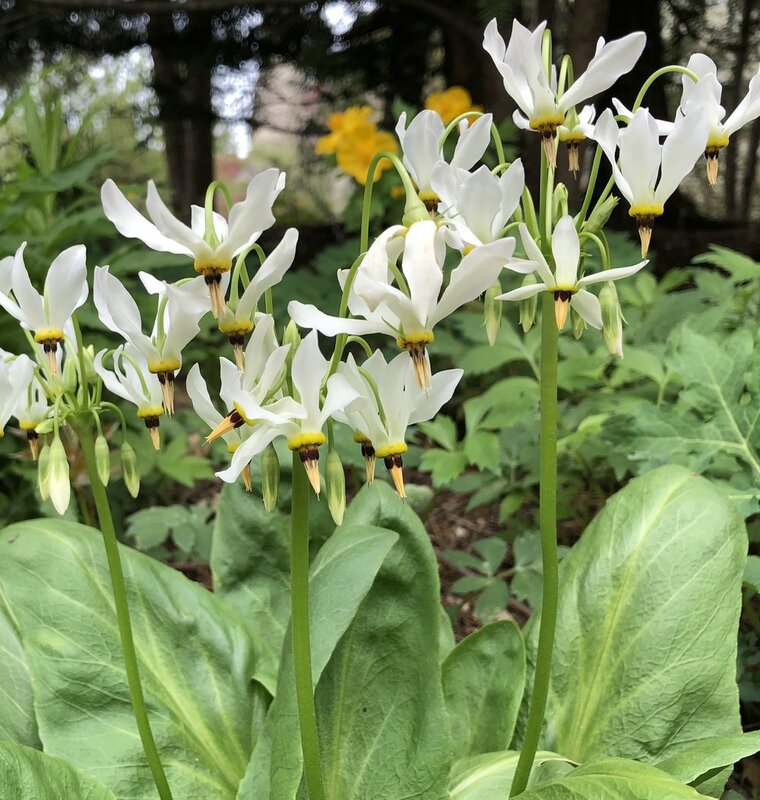 In the ensuing years and to this day, the Garden Club of Evanston members have worked diligently to maintain the Wildflower Trail Garden. The garden celebrated its 80th birthday in 2017.